New York—Swann Galleries’ September 27 auction boasts the Harold Holzer Collection of Lincolniana, a 176-lot offering of the noted Abraham Lincoln scholar’s lifelong passion. The sale’s general Printed & Manuscript Americana catalogue features Revolutionary, Civil War and frontier material, with diaries, archives and important publications. Compiled in a separate catalogue, the Holzer collection explores America’s fascination with depictions of the 16th president, highlighting the breadth of representations of Lincoln. Notable lots include an 1860 painting of the president, still beardless, by John C. Wolfe, and a plaster bust by Sarah Fisher Ames (estimates: $12,000-18,000 and $6,000-9,000, respectively). Among the many nineteenth-century prints is a fourth edition of the scarce “Wigwam Print,” produced for the May 1860 Republican Convention in Chicago. Any edition of the engraving-which was the first standalone print of Lincoln-is a rarity: only four, including the present example, are known to exist. Other items of note include Victor D. Brenner’s 1907 bronze relief plaque, which became the model for Lincoln’s portrait on the penny ($1,500-2,500). Satirical anti-Lincoln cartoons such as Miscegenation or the Millennium of Abolitionism ($5,000-7,500) will be offered, and autographs include a commission signed by Lincoln for his personal secretary William O. Stoddard in July 1861 ($7,000-10,000). The afternoon session of Printed & Manuscript Americana boasts an array of manuscript material relating to life on the frontier, including the diary of Francis W. de Winton, who accompanied Canadian Governor General John Campbell on a grand tour of the Northwest Territories in 1881. The unpublished diary includes historically significant notes on meetings with First Nations leaders ($15,000-25,000). Other frontier accounts include a California Gold Rush diary from 1849; the extensive family papers of the Kniskerns, early Palatine German settlers in Schoharie County, NY; and the 1880s correspondence of Henry Hubman, an Iowa medical student turned Infantryman in Montana, who eventually deserted (estimated at $8,000-12,000 apiece). 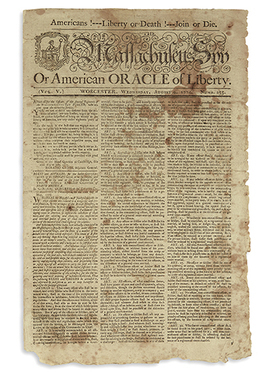 Revolutionary material includes the 9 August 1775 issue of the Massachusetts Spy, featuring the “Rules and Articles for the Better Government of the Troops,” the first set of regulations governing rebel troops passed by the Continental Congress, and an edition of Thomas Paine’s The American Crisis published in Fishkill, NY by Samuel Loudon, “23 December 1776” ($6,000-9,000 and $25,000-35,000, respectively). A third-edition Book of Mormon, printed in Nauvoo, IL, 1840, is set to bring $8,000 to $12,000. Other LDS highlights include a daguerreotype of a young man believed to be Frederick Granger Williams Smith, the son of Joseph Smith. The late 1850s image is hand-tinted, and the subject holds a book that appears to be a Book of Mormon. It comes with an extensive account of provenance and is consigned by a descendant of Hyrum Smith, brother of Joseph ($10,000-15,000). The auction concludes with a large section of Latin Americana, with a series of featured firsts, including: the first novel set in Spanish America, Francisco Loubayssin de Lamarca’s Historia tragicomica de Don Henrique de Castro, a probable first edition, 1617, and the only copy of any edition known to appear at auction ($15,000-25,000); a first edition of the first book of sermons in Nahuatl, 1577, which has not been traced at auction since 1869 ($30,000-40,000); and a first edition of the first full-length book printed in Puebla, Juan de Palafox y Mendoza’s Historia real Sagrada, 1643 ($8,000-12,000). Image: Lot 199: Issue of the Massachusetts Spy featuring “Rules and Articles for the Better Government of the Troops,” Worcester, 1775. Estimate $6,000 to $9,000.